Not that it was surprising to find …Guantánamo courting controversy; Michael Winterbottom and Mat Whitecross’s film focuses on the ‘Tipton Three’, a trio of British Muslims who were held in Guantanamo Bay for more than two years until they were released without charge. For Shafiq Rasul (played by Riz Ahmed), Ruhel Ahmed (Farhad Harun), and Asif Iqbal (Arfan Usman) and their friend Monir Ali who ‘disappeared’ in Afghanistan just prior to the trio’s incarceration and was never found, a spur-of-the-moment trip from Pakistan to Afghanistan, allegedly to offer help to civilians during the US’s first retaliation attack for 9/11, turns into a nightmare when they are grabbed by the authorities, transported and detained in crowded, sub-human conditions then transferred into US custody. This, according to their story and the film, is where things got really bad. A little time has passed since seeing the film and the opportunity I had (for which I am very grateful) to meet the Tipton Three in person. This is just as well, because both experiences left me with those least objective of emotions, rage and pity; a brief cooling-off period was required to gain some balanced distance. As far as the ex-detainees are concerned, there was no sense that they were concealing anything. At the time of their imprisonment, all were obviously nothing more dangerous than angry-ish young men. All had been involved in petty crime in the UK, and that was it. Much has been made, by the film’s detractors, of the ‘actual’ reasons behind the young men’s reasons for going to Afghanistan – the fact that this was the only reason for their incarceration – "What are you doing here? We don’t believe you." – does not seem to have discouraged said critics from taking an equally ludicrous stance. They were clearly not terrorists. They were not jihad. 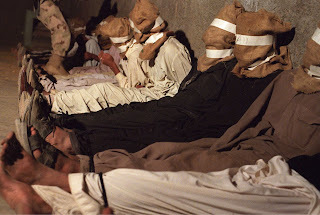 As the film is at pains to make clear, during its recreations of Q&A sessions with interrogators whose methods range from terrifying brutality to chilling impassivity, the men had rock-solid alibis for all the occasions when they were supposedly caught on camera at jihad rallies – they simply weren’t there. As Asif told me: "For Christ’s sake, you know, I was working at Currys [at the time of the rally]. I knew that there would be documentation in the UK to prove that, but nobody checked it out." The film is relentless and harrowing. As with United 93 (2006), Paul Greengrass’s take on the passengers and crew who fought back on 9/11, questions will inevitably be asked as to whether there are certain areas of human experience into which cameras should not be allowed for ‘entertainment’. This, despite the film’s obvious sincerity as a social record, is a valid argument, one that stands head and shoulders above "Ah, but were they innocent really?". Regardless of whether the Tipton Three were responsible for 9/11 itself and any exaggeration (which there of course may be) of what the men suffered, "the degree of civilization in a society can be judged by entering its prisons," as Fyodor Dostoevsky so rightly said. So, some might say, the film’s only half accurate. It’s only a quarter correct. This reviewer cares not. This, it would appear, is America. And the bad news starts here.